Social media activity is an important piece of the puzzle for businesses using their websites to attract followers, leads and customers. But all too often, the task is larger than accounted for, resulting in abandoned accounts or profiles and lost opportunities where benefits could be seen. Once you're ready to commit and learn how to use social media tools effectively, the following tips will help you with pre-planning social media and becoming even more skilled at gaining the most value from the time you invest in the task. 1) Commit to the process. If you want real results with social media, you can't just dip your toes in the water. To make it a true part of your digital marketing plan, you need to make it an essential daily ritual, just like checking your e-mail or voicemail. Don't skip a scheduled day, if possible, as you'll want to maintain an active presence on your social sites. 2) Know your social media goals. Don't start social media if you're unsure of your goals. A few goals you should consider include: 1) increase brand awareness 2) create a social media presence 3) increase website traffic 4) build customer loyalty 5) increase conversion rates. 3) Do it at the same time each day. Following a routine helps to create habits. For many, pre-planning social media at the very beginning of the day or at the end of every day works well. Whatever works for you, checking and posting your social media content at the same time each day helps you commit and also lets you interact with the right audience at the right time. 4) Set a time limit. At first, you might feel like you're wasting time on social media. This may be due to several factors: 1) you are learning the platforms 2) you are testing content for its effectiveness and/or 3) you are building your network or following. In time, you should be able to monitor and post to your accounts in about 20-30 minutes per day. 5) Focus on two to three main social media channels. Trying to have a strong and meaningful presence on more than a few social media sites may turn out to be counter-productive — unless you have a large marketing team with a social media focus. Most businesses find that their audiences gravitate toward a few main networks to find information. Neil Patel has done extensive research that you can read here for some of the general themes or focuses of some of the top social media platforms. 6) Know the best times to post for your audience. How do you know when the people you want to reach are using social media? 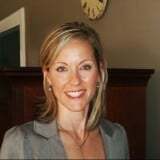 You may find some of this information in your buyer persona research, but even more accurate information will come from practice, engagement and simply, time. Once you've found the times that are prime for your audience, using a scheduling tool makes it easy to reach them at these specific times when you know they will be engaged and paying attention. 7) Eliminate other distractions (phone, e-mail, meetings). We all have distractions that arise throughout the day and it's always a challenge to stay on task. When working on social media, do whatever you possibly can to eliminate those common distractions so that your efforts will be focused and in line with your time limits. 8) Use the right tone/voice for each unique platform. Along with choosing the right platforms, you'll need to effectively "speak the language" of the ones you choose. Some platforms require a more professional voice while some are ultra-casual. This post will help you learn the widely accepted tones of some of the top platforms. 9) Add your own images. Stock photos and images won't help to tell your unique story or connect you to your target audience. Whenever possible, it's best to use your own photography, images or artwork in your social media posts and other content you share. 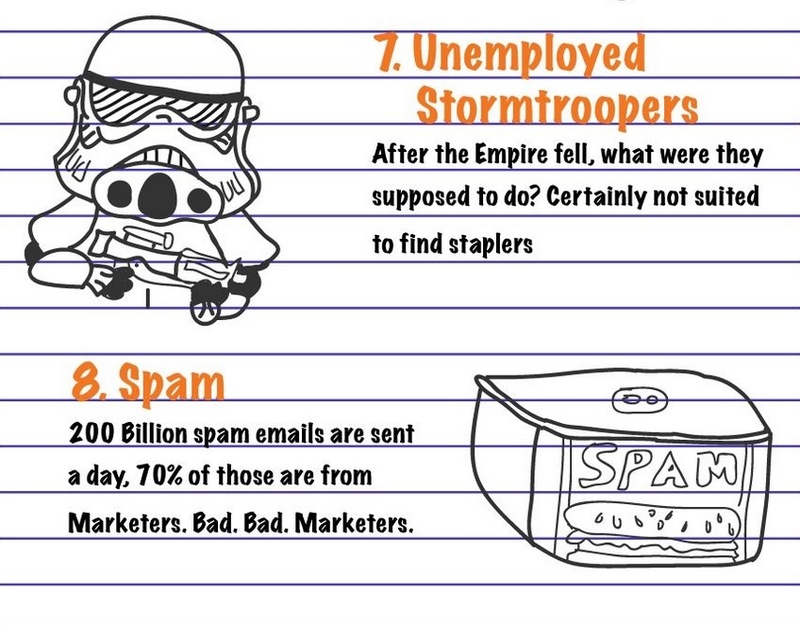 In the survival guide infographic excerpt below, our designer illustrates the piece with simple, original drawings that perfectly help to tell the story of the content. 10) Focus your posts around a campaign. Social media should be an avenue for executing the plans of your larger marketing plan. 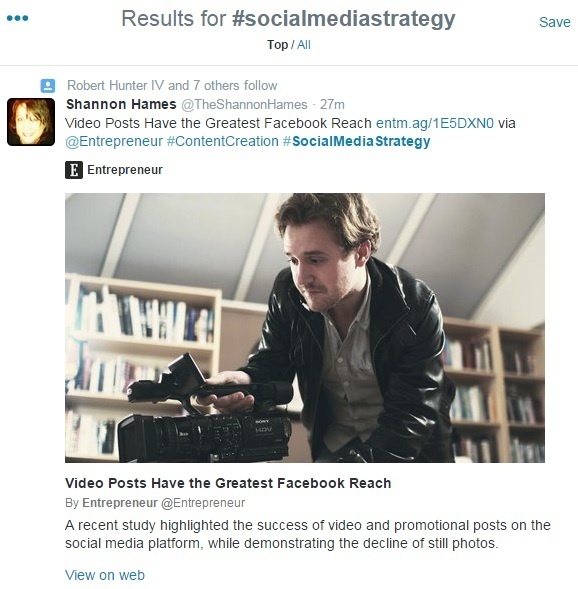 The options for sharing content around campaigns or promotions are endless on social media. So, once your annual campaigns are planned, you can immediately plan your social media outreach reflecting the campaign theme(s). 11) Follow strategically. A large following is great, but if it's random and irrelevant, it won't help your business. It may take more time to build a quality following of individuals who are genuinely interested in your product/service, but in the end, this type of group will prove more valuable to your business. 12) Schedule posts. There are several tools available that will allow you to schedule out your posts ahead of time. This way, you save time and also reach potential leads at many times of the day. Tools like Hootsuite, Buffer or the Hubspot social publishing tool let you easily choose the platform, customize your message and choose the time it will be posted. 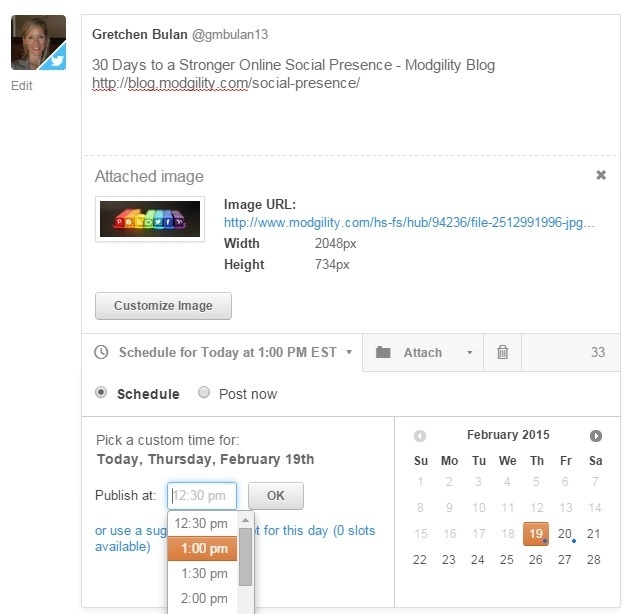 The example below shows a Twitter message being scheduled with the Hubspot social publishing tool. You can change the message, add an image and choose the day and time for posting. 13) Plan your posting frequency and placement. Planning the number and placement of your posts will first and foremost help you to know when you're done! Strategically, the different platforms tolerate different levels of posting frequency. One suggestion would be to post 15-20 posts per day across your social media accounts (10 Twitter, 3 Facebook, 3 LinkedIn, 2 Pinterest). 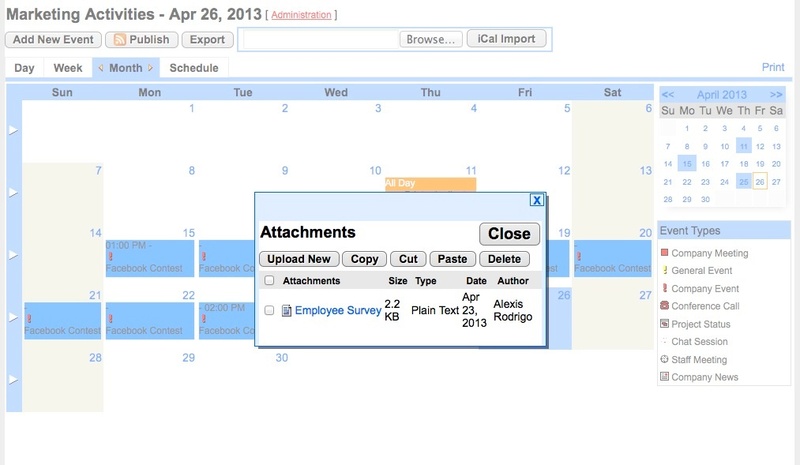 14) Use an editorial calendar. Map out the month or even the year around the events, seasons, holidays, promotions or any other important times for your business. Plan relevant posts and assign responsibility for developing content. Then, you'll be ready to share it at the right times and engage with the right people. 15) Prepare posts in "batches." Identify themes and develop groups of posts that relate to each other. This will save time and help build a unified voice around specific topics. You can schedule the posts at different times with the benefit of producing them at one time. 16) Use hashtags to follow conversations on Twitter. You can easily set up a stream with your social media tool, like Tweetdeck or Hootsuite to follow the conversations around the terms, issues or problems that are important to your audience. The term below, 'social media strategy' might be followed by an agency offering social media consulting that is interested in joining conversations with those looking for that service. Following this term brings them closer to interacting with the right audience. 17) Stay focused on your task. If you set aside the time to dedicate to social media, do your very best to stay focused on your task. Try not to get distracted by other interesting or eye-catching content you come across. 18) Have go-to sources of curated content. Read all you can about relevant topics for your business and follow the leading thought leaders in your industry. This will give you some great sources of content that may be interesting to your audience or could serve as inspiration for your own content. 19) Plan another 10 minutes later in the day. If possible, sneak in another brief social media session during a break or lunch to check comments, follows or replies on a couple of networks. As long as you can keep it brief, this will help you to stay on top of what's going on in your networks throughout the day and reply to any important comments or connections. 20) Share your own content sparingly. If you're creating your own content, it may be tempting (and easy) to just push out your own great content. The best approach, however, is to be extemely generous and complementary of others' content — sharing, asking questions and praising when praising is due. 21) Track progress of your posts. Knowing which posts or topics generate interest, comments, or even better, leads, can help you to narrow your focus for social media updates and increase engagement to know what's working. 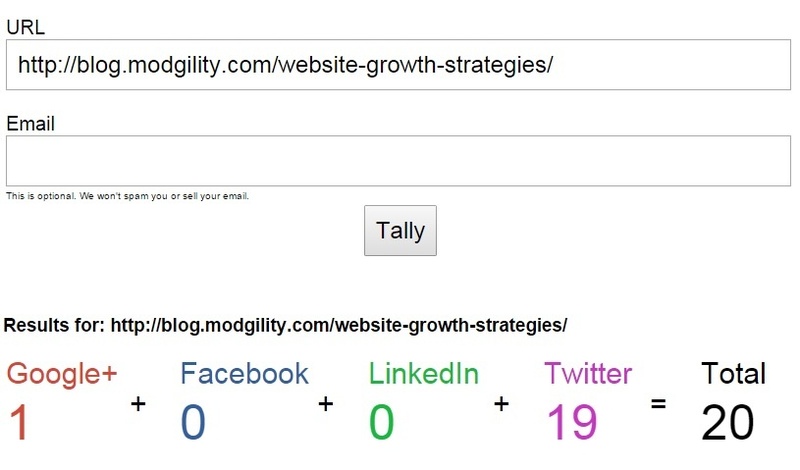 Link Tally, shown below, is a tool that will show you how many times a piece was shared on four main social media platforms. 22) Divide and conquer. If you have a team that you work with, use them. Every person within your organization can be a promoter of your business on social media. With multiple accounts and people posting for your company, you will multiply your social media reach greatly and save time for everyone. 23) Pick one day each week to reserve time for leisure searching. You may find yourself feeling like you're missing a lot on social media because you've put yourself on a strict schedule. If this is the case, allow yourself some extra time, perhaps on the weekend, to 'catch up' on what you missed or read some things more thoroughly than before. 24) Post good content more than once. If you have a great piece of content that you wish to share, it's OK to post it more than once and on more than one platform. One main reason for this is that different segments of your audience may be using a site, like Twitter, for example, at different times of the day. By posting a great piece of content at a few different times, you give yourself a better chance to reach more of your network. 25) Don't forget to stop. As an extension to tips #3, #7 and even others above, this tip goes directly to your efficiency and productivity. If you've ever come to the end of the day and wondered, "What did I do today?" then you know how inefficiency with social media can snowball into a real problem if you're not careful. Social media activity is just noise if you don't have a plan to evaluate your efforts and your time spent. If done well, pre-planning social media can add true value to your business and enhance your digital marketing efforts. First, create a sound social media strategy as a part of your marketing plan. To support this strategy, you'll naturally come up with questions that you'll want to answer with your social media activity. Could you be reaching a wider audience? Is lead generation from social media possible or realistic for your business? The more defined your goals are, the easier it will become to choose the right social media activities for getting the results you want. While social media is definitely a worthwhile investment of time for most businesses, some other things may be dragging down your marketing strategy. Take a look at our e-book below to find out which marketing tactics you may want to consider eliminating for this year.